We all love to have a cup of tea when we get up in the morning or when we are tired. Tea also has a lot of health benefits. It is rich in antioxidants and protects you from various ailments. There is green tea, black tea, herbal teas and so on. Herbal tea is amazing to taste and are made with various herbs that are good for the skin. Having a cup of herbal tea in a cold winter makes you refreshed and energetic. Herbal tea or tisane is made by steeping herbs, spices or other plant materials in hot water and making a decoction of it. Herbal tea is usually without any caffeine. Herbal tea contains a lot of medical properties and therefore is good for your health. You may consume herbal tea three or four times. This will provide you effective results. When making herbal tea, make sure about its quality. Try not to use tea with artificial flavors. It is better that you consult your doctor before you start taking herbal tea, as some herbs may not suit everyone. Some of the herbal teas should be avoided during pregnancy and lactation. 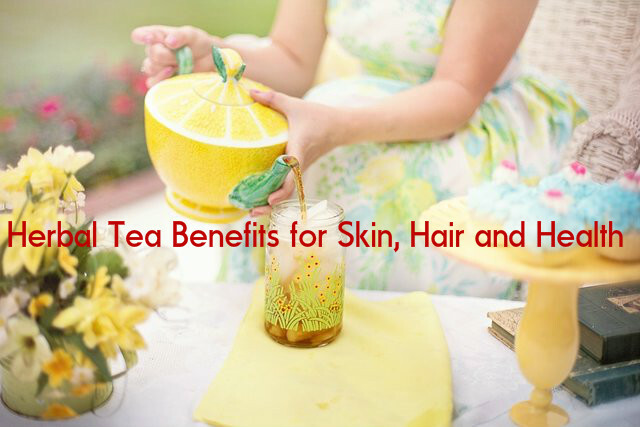 Drinking herbal tea or applying it topically on the skin can help you get rid of acne without and side effects. You can also make acne mask with herbal tea or mix it with a toner and cleanser. Clean you face and apply the herbal tea on your skin. Wait for 10 minutes and then wash off with plain water. Soak a towel in the steeped tea and place it on your face for 15 minutes. Wash and apply a moisturizer. Rooibos tea is good for treating acne. Chamomile tea can cure psoriasis, acne and eczema. Applying it on the skin will help in reducing acne causing bacteria. Spearmint tea helps in preventing oxidative damage on the skin. It reduces the bacteria that cause acne. Green tea provides you a healthy skin and is great for treating acne. If you are suffering from rheumatic aches, drinking herbal tea is very effective. The pain caused by the widening of blood vessels is also cured by herbal tea. Arthritic patients benefit a lot by consuming ginger tea. The antioxidants in herbal tea help in preventing cell damage caused due to pollution and free radicals, and therefore lower the process of aging. Herbal teas are mild anti-depressants and therefore elevate your mood by stimulating the chemicals in the brain. Herbal tea is great for getting you relief from nerve pain and to improve your memory power, it also ensures that your brain functions properly. If you are suffering from high blood pressure, it can affect your heart and the kidneys. Drinking hibiscus herbal tea can help you lower the blood pressure naturally, without any side effects. This tea is devoid of caffeine and rich in flavonoids and phenols, which are good antioxidants. You can treat cold and cough by making herbal tea using the ‘elder tree’ herb. It is also an effective decongestant. Drinking this tea helps in opening the blocked nasal passage, so that cough and asthma are reduced. It also induces sweating by increasing the temperature of the body, so that the virus in the body is disabled. If you are a diabetic patient, drinking sage tea and bilberry tea can help you cure type 2diabetes and lower the blood sugar levels. When an infection is in its early stage, herbal tea is a good remedy to get rid of it. Ginger herbal tea helps in lowering the fever and allows the infection to heal fast. Consuming herbal tea is very effective for detoxifying the kidneys. This helps in getting rid of all impurities from the kidney and thus makes you healthy. The healing properties of herbal tea help in healing ulcers, sores, cuts and wounds. Chamomile tea is best for healing. Herbal tea is also good for proper digestion of the food you consume. It helps in reducing and breakdown of body fat in the digestive canal. Herbal tea is rich in iron, calcium and silica. Iron is essential for the production of red blood cells and provides you more energy. Silica and calcium are required for healthy bones, nail and teeth. Maximum amount of iron is found in Nettle tea. Herbal tea has been used for treating nausea and vomiting form the ancient times. Herbal tea helps in breaking down the fats in your digestive system and thus provides you relief from such symptoms. Pregnant women, who often suffer from morning sickness, get great relief by consuming herbal tea. Add four to five slices of fresh ginger root to a cup of boiled water and make ginger tea. You can drink it two or three cups of this tea per day. Herbal is very beneficial for getting you relief from stress. If you are suffering from anxiety or insomnia, herbal tea can make your body relaxed, thus making you sleep naturally. Chamomile tea is very beneficial for relieving stress and making you relaxed. Fennel herbal tea has anti-spasmodic properties, which help in relaxing the intestinal muscles. So, consuming this tea provides you relief from stomach ache, colic, constipation and flatulence. Herbal tea helps in proper functioning of the thyroid. It detoxifies and cleanses the system, thus making it function normally. Dandelion tea is good for stimulating low thyroid. If you are suffering from mild insomnia, make herbal tea with chamomile. This contains tryptophan, which helps in relaxing your body, thus providing you a good sleep.